One Stop Aerosols provide bespoke custom aerosol spray paint cans for sale in over 10 thousand colours and finishes such as full gloss, semi gloss, satin and matt. We also provide additional customisations such as gloss level, hardness (2K/Pack hardeners with built in activator cans available in all colours) and optional additives such as UV protection and deodoriser if required. Our paints are custom mixed the same day and dispatched for fast UK next day delivery when orders are placed before 1pm on working days (Monday-Friday). One Stop Aerosols source only the highest grade painting supplies available on the market which makes our paints the perfect choice for all commercial, industrial and domestic painting requirements. 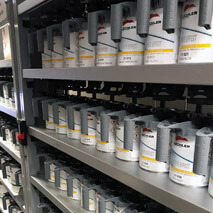 We stock the entire range of RAL, Pantone, British Standard, Federal Standard, NCS, Master Chroma and luminous paint colour chart ranges in both 1K and 2K rattle canisters using the highest quality Lechler paints and binders. Custom spray paint cans are rated 5 out of 5based on 1 customer review. All aerosol paint cans we supply are provided at the lowest price available online or on the high street, this includes the most popular colours on the market in the UK such as RAL 1035, Pantone 280 and RAL 7035 spray paints. If you have any questions about our custom aerosols or the bulk discount offers we provide for business's please contact us.